I've had some requests to showcase my Graduate poem to make it easier to find especially this time of year. 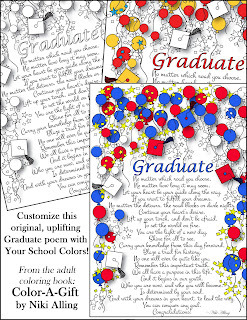 So here is the link to my Graduate Poem gifts on Zazzle. Click the poster to find many gifts with this poem. For anyone who loves to color, this fun coloring page from our new book, Color-A-Gift, is perfect for graduation! Customize with your school colors!